There are generally four different types of shock. These are obstructive shock due to cardiac tamponade, tension pneumothorax and pulmonary embolism, cardiogenic shock due to arrhythmias, acute damage to the valve and myocardial infarction , hypovolemic shock due to gastrointestinal loss , burns, hemorrhages (may present with late features of low blood count) and distributive shock due to neurogenic shock /spinal trauma, anaphylaxis and sepsis. 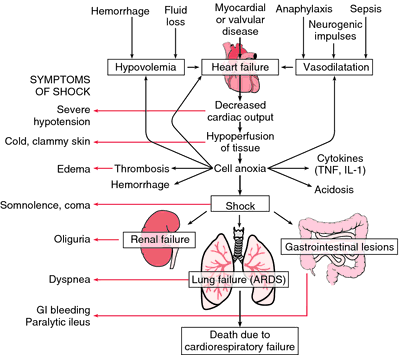 Any abnormality of the blood circulation is associated with shock. This later result with inadequate perfusion of the organ and oxygenation of the tissue. Patient may present with chest pain. Pain in the chest may be due to trauma to the chest or pathological condition such as pulmonary embolism that present with pleuritic chest pain or myocardial infarction that present with central crushing pain in the chest. Patient may also present with shortness of breath /dyspnea. Dyspnea is associated with cardiogenic shock due to pulmonary edema. Besides that, the main symptoms of obstructive shock is also shortness of breath and syncope. History of trauma is very important . Trauma due to penetrating injury may lead to hemorrhage. It is important to assess the amount of blood loss. Cardiac tamponade, myocardial contusion and tension pneumothorax are associated with blunt trauma. Closed fracture is associated with trauma to the long bone or pelvis which is not significant and not apparent to the observer. Gas explosion, water heater explosion and fires are associated with thermal injury. Peripheral nerve or spinal injuries are associated with acute onset of paralysis. Hypotension may occur due to the loss of vasomotor tone as a result of injuries to the spine that affect the descending sympathetic pathways. Anaphylaxis ( distributive shock) will present due to exposure to allergen such as insect venom ( wasps, bees), intravenous contrast media, food product (peanuts, eggs, shell fish ) , anesthetic agents and penicillin. Septic shock is associated with infection and systemic evaluation is important. Hypovolemia that occur as a result of gastrointestinal loss is characterized by abdominal distention , colicky abdominal pain, constipation, vomiting ( due to intestinal obstruction), diarrhea and profuse vomiting. On inspection, urticaria and angio edema are associated with anaphylaxis reaction. Sites of penetrating trauma ( justify by bleeding point) or burn should be focused. Cyanosis is associated with tension pneumothorax or large pulmonary emboli. Blood pressure measurement may indicate low blood pressure ( hypotension) which is the late features of the shock. Patient may be warm if he suffers from septic shock ( pyrexial patient) or cold, pale and clammy in most cases of shock. Characteristic of the pulse is important. Tachycardia is an indication of shock except in neurogenic shock. The pulse is weak and arrhythmic in term of rhythm which may lead to cardiogenic shock . Cardiac tamponade may present with pulsus paradoxus which is decrease in the amplitude of pulse during inspiration. Jugular venous pressure ( JVP) will raise in obstructive shock and cardiogenic shock. However JVP is low in hypovolemic shock. On auscultation, the present of murmur is an indication of acute valvular insufficiency due to cardiogenic shock. Unilateral breath sound is due to pneumothorax while anaphylactic shock is presented with wheezing and bronchospasm. Cardiac tamponade may present with muffled heart sound. The investigations require are full blood count, urea and electrolytes, pulse oximetry, chest x ray and ECG. In full blood count, raised white cell count is associated with acute physiological stress or infection. Low hemoglobin is an indication of loss of blood. In term of urea and electrolytes , raised creatinine, raised urea and low serum potassium and sodium are the common abnormalities for gastrointestinal loss. Pulse oximetry may reveal low saturation of oxygen which is due to pneumothorax and pulmonary embolism that associate with severe impairment of saturation of oxygen. Pulse oximetry is followed by arterial blood gases. Chest X ray that is normal may be associated with cardiac tamponade. Pericardial effusion is characterized by globular cardiac silhouette. Trachea deviation is associated with pneumothorax. ECG investigation may reveal alternating small and large QRS complexes or electrical alternans that is associated with pericardial tamponade. Pericardial effusion is presented with low amplitude complexes widespread in nature. The ECG is also useful for identification of arrhythmias or myocardial infarction. CT scan or MRI scan of the spine is important to identify and confirm the extent of the injury. In septic shock, underlying organism may be identified by site specific cultures and blood cultures. CT pulmonary angiography is useful for diagnosing pulmonary embolism due to shock. A formal contrast pulmonary angiogram is useful in case of thrombolysis as an emergency therapeutic measures. Echocardiography is useful for detection of cardiac tamponade, dysfunction of the valve and right heart failure with massive pulmonary embolism.